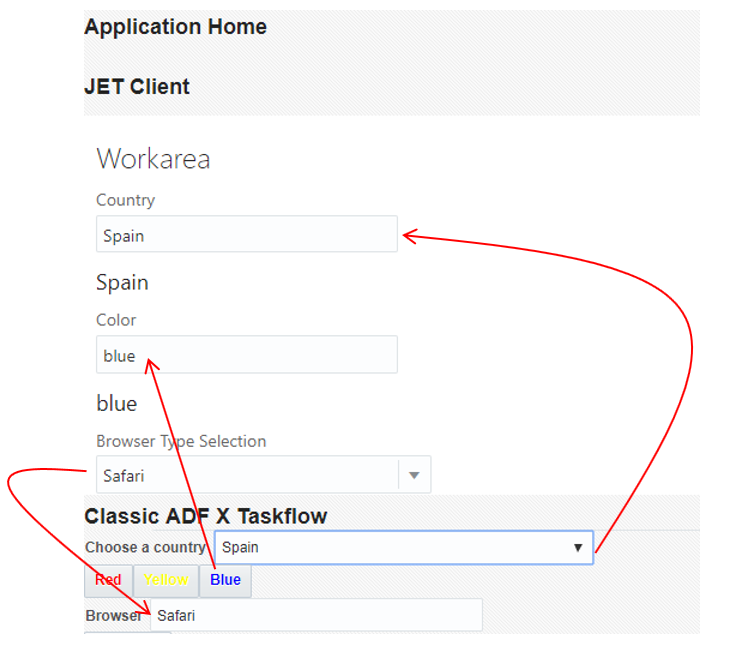 For one of our current projects I have done some explorations into the combination of ADF (and WebCenter Portal in our specific case) with JET. Our customer has existing investments in WC Portal and many ADF Taskflows and is now switching to JET as a WebApp implementation technology – for reasons of better user experience and especially better availability of developers. I believe that this is a situation that many organizations are in or are contemplating (including those who want to extend Oracle EBusiness Suite or Fusion Apps). This is not the ideal green field technology mix of course. However, if either WebCenter Portal (heavily steeped in ADF) or an existing enterprise ADF application are the starting point for new UI requirements, you are bound to end up with a combination of ADF and the latest and greatest technology used for building those requirements. We have to ensure that the rich client based ‘Portlets’ are nicely embedded in the ADF host environment. We also have to take care that events triggered by user actions in the ADF UI areas are communicated to the embedded rich client based UI areas in the page and lead to appropriate actions over there – and the same for actions in the embedded UI areas and events flowing in the other direction. 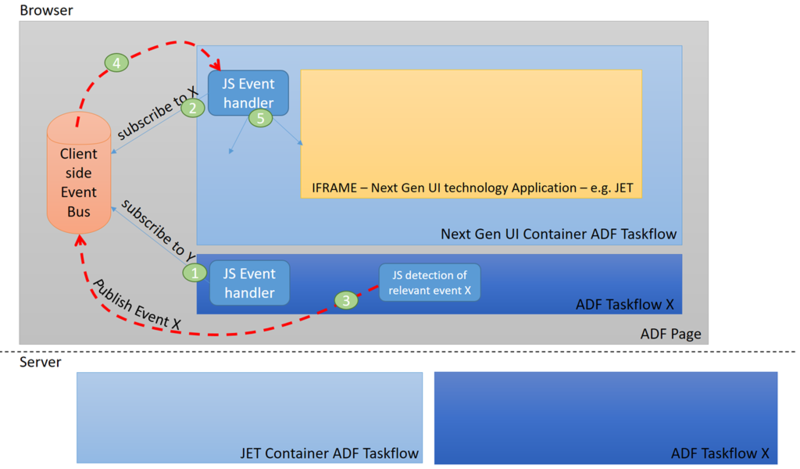 In two previous articles (Publish Events from any Web Application in IFRAME to ADF Applications and Communicate events in ADF based UI areas to embedded Rich Client Applications such as Oracle JET, Angular and React), I have described how events in the embedded area are communicated to the ADF side of the fence and lead to UI synchronization and similary how events in the traditional ADF based UIs are communicated to the embedded areas and trigger the appropriate synchronization. The implementation described in these articles is based on pure, native ADF mechanisms such as server listener, contextual event, partial page refresh in combination with standard HTML5 mechanism for publishing events on embedded IFRAME windows. The route described using these out of the box mechanisms is robust, proven and very decoupled. It allows run time configuration in WebCenter Portal (wiring of taskflows leveraging the contextual event). This route is also somewhat heavyhanded; it is not very fast – dependencing on network latency to the backend – and it puts additional load on the application server. There is a fast, light-weight alternative to the use of contextual (server side) events for communication between areas in an ADF based web page. One that can help with interaction between ADF based areas and non-ADF areas (JET, React, Angular) – but also with interactions between two or more pure ADF areas. An alternative that I believe should be part of the native ADF framework – but is not. This alternative is: the client side event bus. 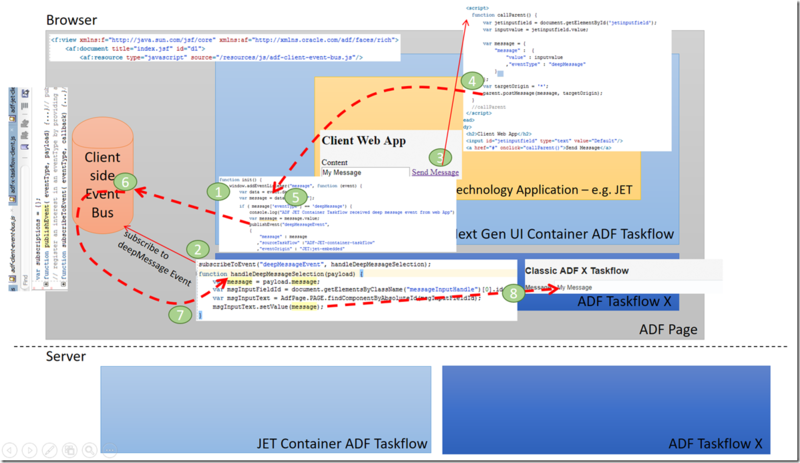 The ADF application embeds a client side web application in an IFRAME in an ADF Taskflow – ADF-JET-Container-taskflow. The application contains a second taskflow – ADF-X-taskflow – that is pure ADF, no embedding whatsoever. 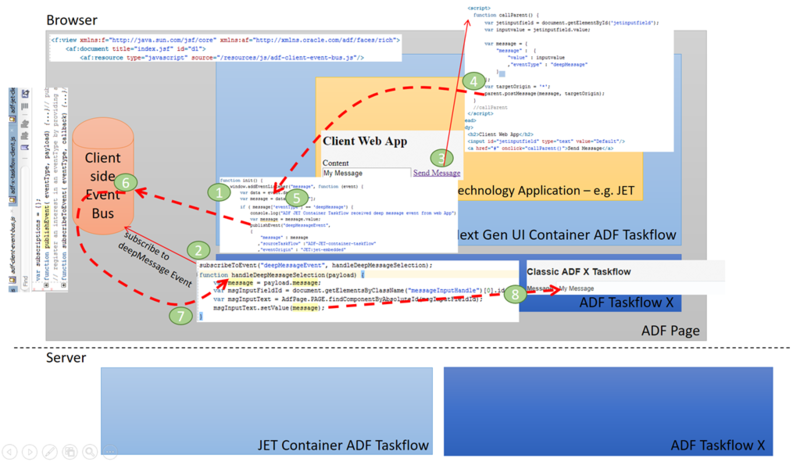 The challenge: an event taking place in the client side UI area produced from ADF-X-taskflow should have an effect in the client side web application – plain HTML5 or Oracle JET – in the IFRAME in the UI area produced from the other ADF Taskflow, and we want this effect to be produced as quickly and smoothly as possible and given the nature of the event and the effect there is no need for server side involvement. In this case, using contextual events is almost wasteful – it is not simple to implement, it is not efficient or fast to execute and it does not buy us anything in terms of additional security, scalability or functionality. So let’s use this client side event bus. 2. Add adf-client-event-bus.js to the main index.jsf page. 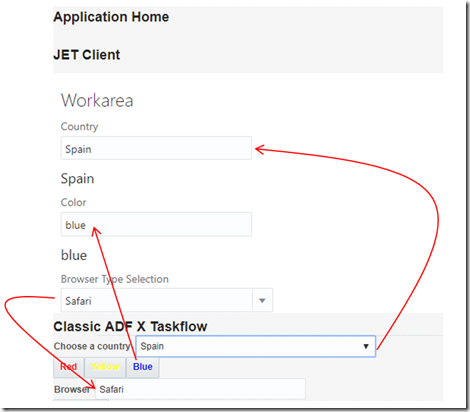 "selectedCountry" : selectedItem._label, "sourceTaskFlow" : "ADF-X-taskflow"
When the user selects a country using the dropdownlist in area ADF X, the selected country name is displayed almost instantaneously in the IFRAME area based on the rich client web application. The interaction as described above with a plain HTM5 web application embedded in an ADF application is not any different when the embedded application is an Oracle JET application. This figure shows an example of a JET application embedded in the JET Client area. It consumes two client side events from the ADF parent environment: countrySelection and colorSelection. It publishes an event itself: browserSelectionEvent. 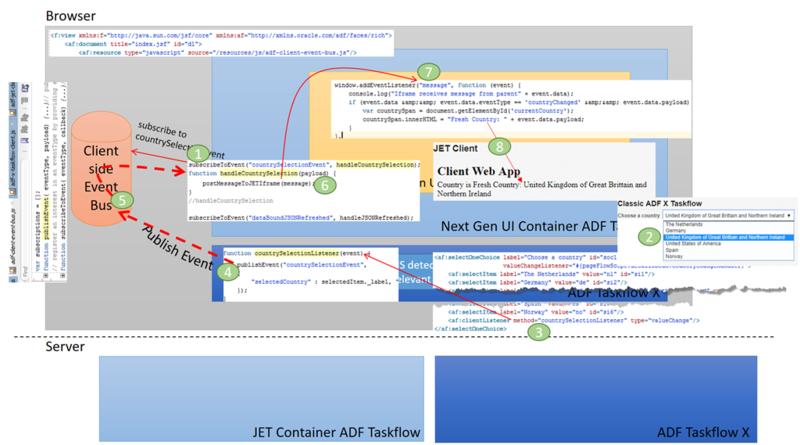 All interaction around these events with the client side event bus is taken care of by the ADF JET Container Taskflow. All interaction between the JET application and the ADF JET Container Taskflow is handled through the postMessage mechanism on the IFRAME’s content window and its parent window.